Garage storage systems are do-able as a DIY project, however, as you’ve no doubt realized, there are limits to one’s organizational skills and installing storage fixtures is only a small step toward organizing the possessions you store in your garage. A professional garage storage systems installation is the best answer to your disorderly garage. Having an expert in garage protection and storage on the job will ensure that your property is stored in a sensible manner and you’ll be able to access what you need when you need it. Moreover, engaging the services of a garage storage systems expert ensures that the right storage fittings and fixtures will be in place to keep your garage neat and orderly, once and for all. Prestige Floor Coating has a reputation as the premier floor coating company in the Mid-Atlantic area and beyond. Our floor coatings have been protecting concrete surfaces in Maryland, Virginia, Pennsylvania, and Delaware, for more than two decades. Prestige products are superior and our customer service is excellent. Our commercial and residential customers consistently rank us at the top when it comes to customer satisfaction. We approach our garage storage systems with the same attention to detail that has made us number one in the floor coating arena. We know what works. Years of working with homeowners to better their garages has given us an in-depth look at how to best store and organize everyday items that many homeowners overlook. Whether you are looking for a simple garage storage system or a fully customized solution, Prestige Floor Coating can help. At Prestige, we offer simple, effective garage organization systems that fit the needs of most homeowners, but should you need a more complex, customized garage storage system, our partners at Cornerstone Closets will work with you to design a system unique to your needs. At Prestige, our reputation and your satisfaction are of utmost priority to us. We choose only partners that uphold the same commitment to quality and customer service that we do, so rest assured that whether you are working with us, or one of our garage storage system partners, you are receiving the highest quality product and service in the area. Solve your garage storage and organization needs and restore order to your garage today. Contact Prestige Floor Coating about our garage storage solutions. We will gladly walk you through our garage storage system options and put you in touch with one of our trusted custom garage storage solution partners if necessary. 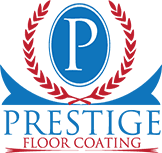 At Prestige Floor Coating, our goal is to provide you with the best possible customer service and the highest quality garage storage solutions available on the market. Call us at 443-519-2628 or contact us online today for your free estimate!